Here at Seed Savers Exchange, to say we grow a wide variety of fruits, vegetables, and flowers would be an understatement. With decades of experience growing hundreds of vegetable varieties in production and garden settings, our crews at Seed Savers Exchange have learned a thing or two about support systems. 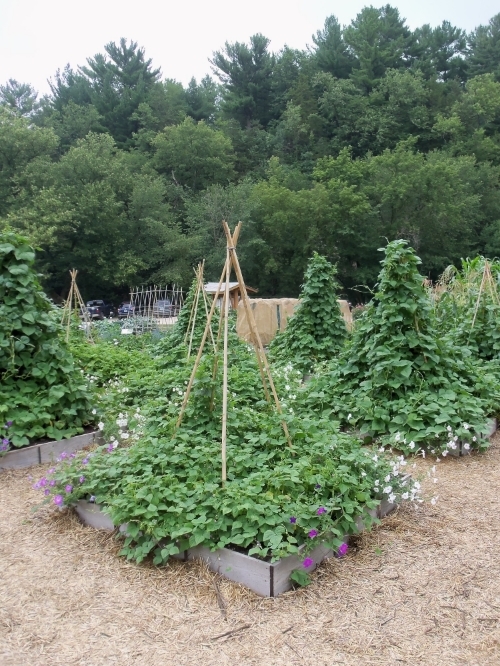 Here are some trellises we like to use around the farm. 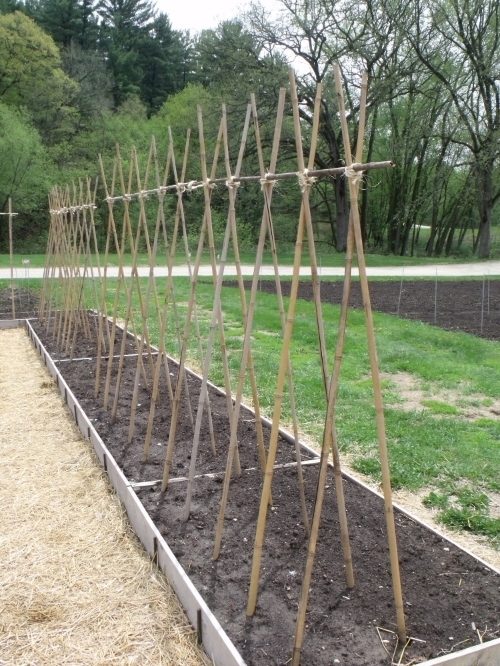 These trellises are made by creating a small frame with long legs out of untreated cedar. Chicken wire is stapled onto the frame, and hinges are used to attach two frames together at the top. This construction allows flexibility of width in the garden and flat winter storage. Unruly chicken wire is contained when attached to the frame, and the trellis can be used for years to come. 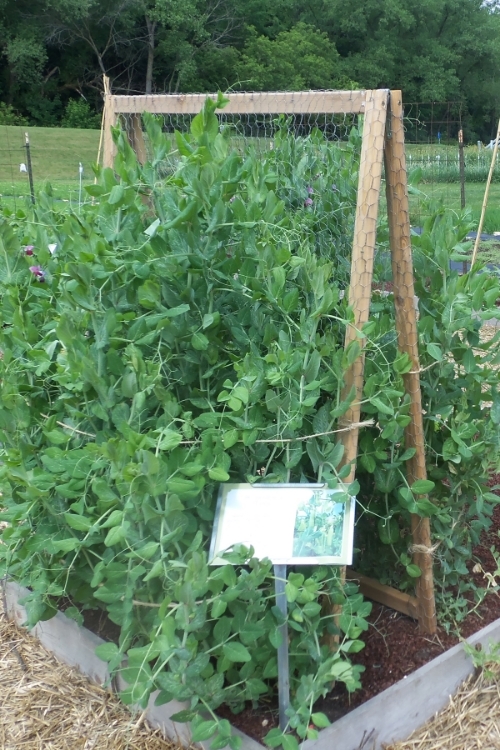 This is a good trellis for peas, shorter beans, and vining flowers. Bamboo stakes are incredibly useful around the garden, and trellis systems of all types can be made with a handful of stakes and twine. Tee-pees can be created by installing several stakes in a circle, then tying the tops together with twine. Long bamboo walls are made by creating two lines of poles about a foot apart, and tying the tops together. A stake placed perpendicularly on top of the poles adds stability. Bamboo trellis systems work well with beans, runners, and other strong climbers. Bamboo is not recommended for cowpeas and peas, as they have a more difficult time attaching to the smooth surface of the poles. A t-post and hog panel is the most used trellis system on the Seed Savers Exchange farm because of its ease of installation and versatile use. Two t-posts per panel are installed, and panels are attached with zip ties or twine. Vining plants will climb, and non-vining plants can be tied to the panel with twine for support. 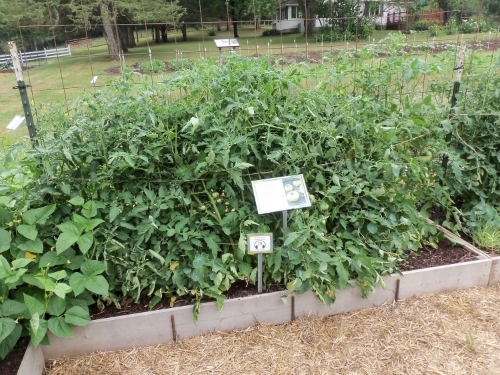 This experimental trellis system is used for displaying cucumbers and small melons. Several t-posts are installed in two lines, leaned outwards to create a V-shape. 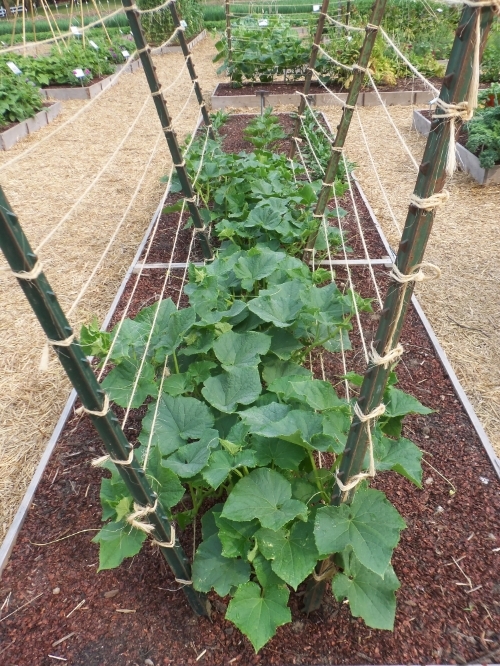 Twine is tied between each t-post to complete each line of the V, and plants are placed on the inside of the V. As cucumbers and other vining plants grow, the fruits will hang on the opposite side of the V in a decorative fashion. Twine can be used throughout the garden to provide support for vining plants. At Seed Savers Exchange, twine is strung between wooden posts in the ground and hooks on the eves of the barn to allow support for climbing morning glories. Feel free to comment at the bottom of this page to share your favorite structures, as well!